The City of Eugene has partnered with the University of Oregon, Lane Transit District, Social Bicycles, and PeaceHealth to launch the bikeshare program, PeaceHealth Rides. Through this program, approximately 300 bikes are available for rent at 36 stations, located in downtown Eugene, in the Whiteaker neighborhood, and on the University of Oregon campus. 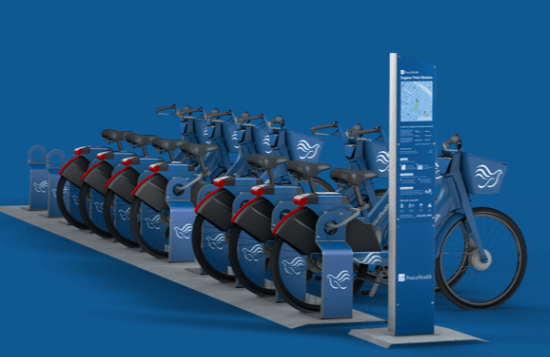 As of April 19, users can sign up for PeaceHealth Rides membership online or via the bikeshare’s mobile app, and rent a bike at any station. Rides are available for a per trip or monthly rate, with reduced ride pricing available for those affiliated with the University of Oregon. PeaceHealth Rides aims to offer Eugene residents and visitors a low cost, green way to get around. For more information see links PeaceHealth bicycle local news and PeaceHealth bikeshare information.